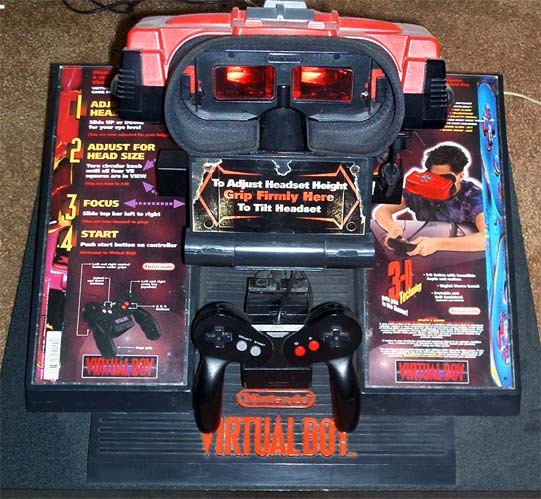 This system was used at stores like Blockbuster and Wal*Mart to let people try out the new Virtual Boy System. This system is very rare because the Virtual Boy did not do well in stores and was discontinued after about a year.. This system is in perfect working order and comes with Mario Tennis. The key to unlock the cover for taking out or putting in games has been lost. However you can change games by removing two bolts. There is some wear on the sticker on the part you grip to adjust the headset hight. Other then that the unit is in perfect condition. This sticker is located on the under side of the section the Headset is mounted to.